Seniors have seen some of the steepest fare increases in recent years. 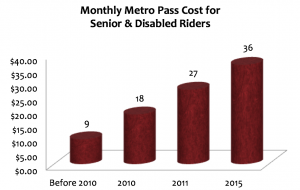 Up until 2011, riders over 65 years of age could purchase an Annual Metro Pass for just $99. In 2015, a mere four years later, the monthly pass cost had risen to $36, for a total of $432 per year! The Transit Riders Union believes that transit should be free for low-income seniors. This wouldn’t be unprecedented; San Francisco’s Muni bus system has a free pass program for low-income youth, seniors and people with disabilities. This was one of the goals of our Affordable Transit Delegation in 2015, and we continue to pursue it. Are you a senior for whom the cost of public transit is a financial hardship? 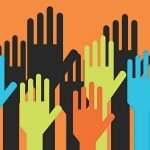 Want to help the Transit Riders Union to win free transit for low-income seniors? Please get in touch!